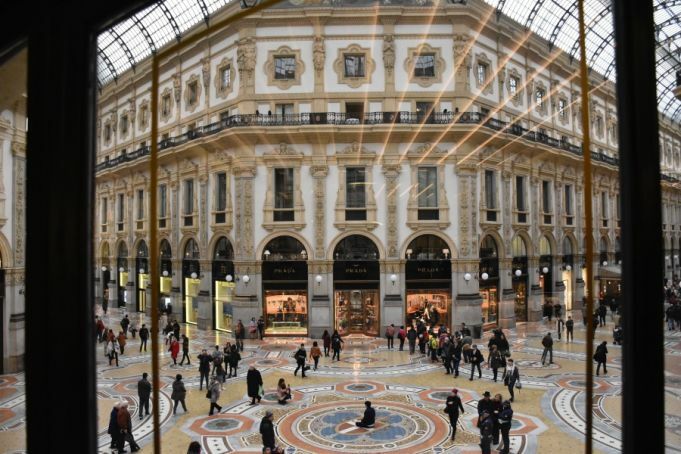 While Galleria Vittorio Emanuele II is a symbol of luxury and sophistication, that does not mean that taking a coffee break inside it, even with an incredible view towards its central mosaic work, necessarily leads to going bankrupt. Pasticceria Marchesi combines a luxurious ambience with creamy cappuccinos that cost €1.80. This spot is also possibly the least obvious destination for tourists who haven’t done any research before visiting the gallery, given that its entrance is not visible from the first floor. It was the Prada group that brought Pasticceria Marchesi into the gallery in 2016 and there are two ways to find it: either take the stairs or elevator under the Osservatorio Prada’s sign or venture inside the Prada Uomo (men's Prada) store from which a separate set of stairs leads to the same cafe. As its full name indicates, the original Pasticceria Marchesi opened in 1824, in Via S. Maria alla Porta. Since then, it has expanded into three venues around Milan, the one inside the gallery being the newest and biggest of all. It offers breakfast, lunch and aperitivo. It is also a great place to have a coffee-break with many options of sweets, pastries, croissants, cakes and chocolates, but above all, accompanied by a privileged view of Milan’s living room. Pasticceria Marchesi 1824Galleria Vittorio Emanuelle II. Mon-Sun 07.30-21.00.